Pineapple is one of our favourite fruits. I love it’s sweet juicy tangy flavour. Though it can be had as it is, last year I tried preparing pineapple squash and preserve. When the pineapple is too sour, I try adding a dash of chaat masala powder and instantly it turns amazing! 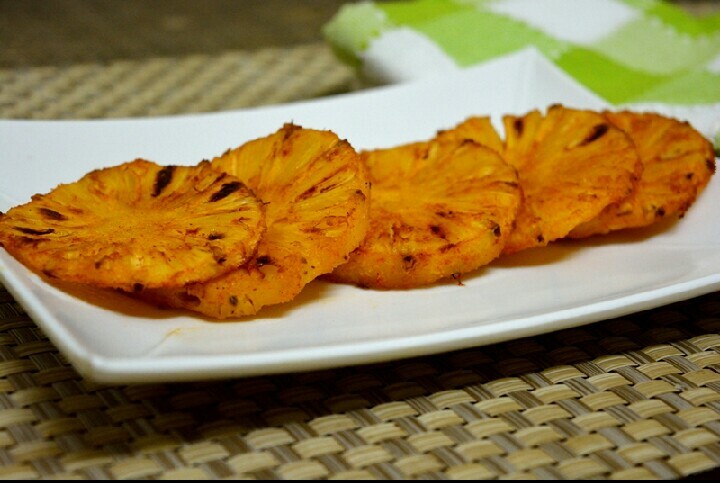 My love for grilled pineapple was realised for the first time in the Barbeque Nation. 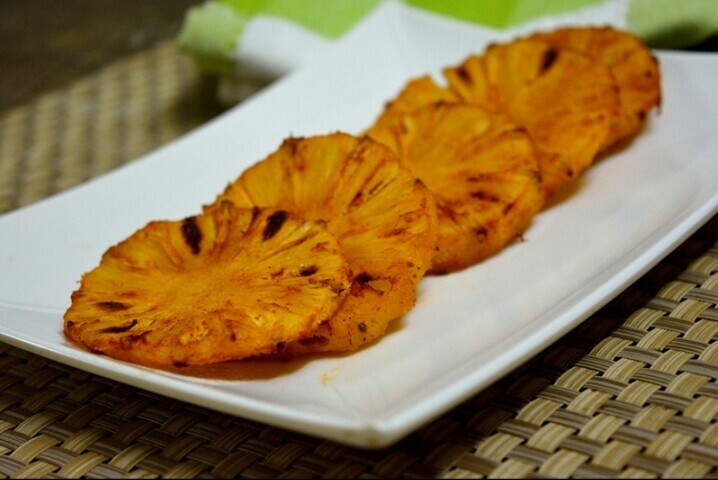 Though I love all their starters, it’s this grilled pineapple I love the most. Not just me, all of us at home enjoy it and ask for multiple serves. Everytime I taste grilled pineapple at BBQ Nation, I resolve to trying it at home only that I keep forgetting. 1. In a bowl, add the pineapple slices along with the paprika powder, salt and oil. 2. Gently mix and coat the spices on all pineapple pieces evenly. 3. Let the pineapple pieces soak and marinade in the spices for atleast 30mins. 4. Preheat the oven at 200deg for 10mins. Line a baking tray with baking sheet. 5. 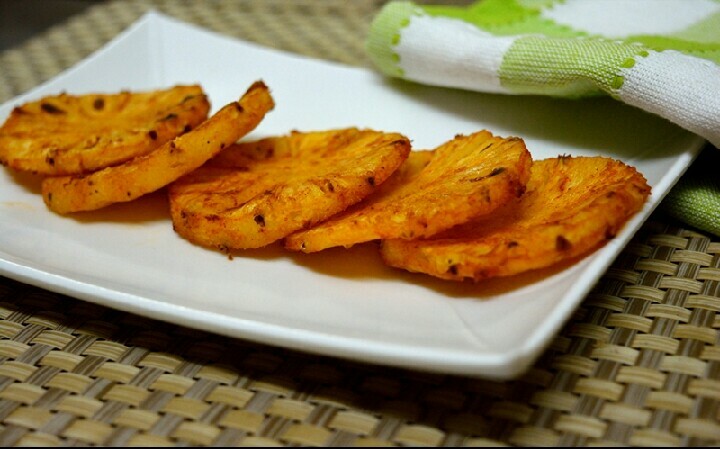 Arrange the pineapple slices on the tray and grill them for atleast 10mins on each side or until golden brown spots appear at 200deg C.
6. Serve hot as a starter or appetiser. Note: The pineapple should be juicy. While grilling it caramelises and turns sweeter. Add salt according to the sourness of the pineapple. If it’s less sour, add a pinch more salt. I tried this out once, and the pineapple let out too much water. What could be the cause and how can utilise be rectified? Hi TNGD – sorry for the late response. If the pineapple is too ripe it might let out water. Also, for this recipe you need the grill option too. Only if it gets heated from top and bottom, it will caramelize faster. On the other hand, you can try a higher temperature to cook out the water quickly. Also, I don’t have the grill option on my otg. What’s the alternative?